The crisis in Turkey continued to roil markets overnight. The MSCI iShares Turkey ETF sold off another 10.9%, with the lira hitting a fresh all-time low at 7.03 (lost 1/3 of its value in a week), while Turkey’s 10-year bond yield remained north of 20%. Global equity markets sold off sharply again with the NIKKEI down 2% ,the SCI off 0.3%, Eurozone shares off 0.3% to 0.6%, and S&P futures were down 0.5%. The euro sank to a fresh 13-month low at $1.1365, as fears of heavy Eurozone bank exposure to Turkey continued to weigh on the common currency. Other emerging market currencies were also rocked, including significant losses in the Russian rouble (69.36, 2-year low), the Argentine Peso touching 29.995 (all-time low), and the South African Rand (15.39, 2-year low). The yen drew some safe haven flows, rallying to 110.11 – a two-month high, as well as the US 10-year bond, with the yield dipping to 2.848% - a 1-month low. The dollar strengthened, with the DX making a fresh 14-month high at 96.53. Gold sold off, and tripped sell stops under the key support at $1205-08 – (9 bottoms – 8/2, 8/3, 8/6, 8/7, 8/8, 8/10 7/7/17, 7/10/17 and 7/11/17 lows), and then the $1200 options strike to reach $1195 – where support at the 5 bottoms between $1195-98 finally held (1/31/17, 2/1/17, 3/9/17, 3/13/17, 3/15/17 lows). Heavy long liquidation was seen. Near the NY open, comments from Turkey’s Treasury Minister that an action plan to support the lira was underway, and that their central bank will provide all the liquidity banks need helped stabilize the lira (6.647), and lifted equities (S&P +10 to 2843). 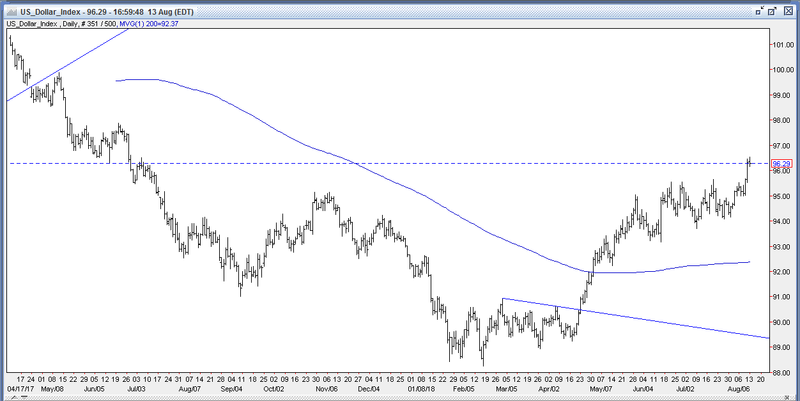 The US 10-year yield climbed back to 2.889%, and the DX retreated to 96.16. 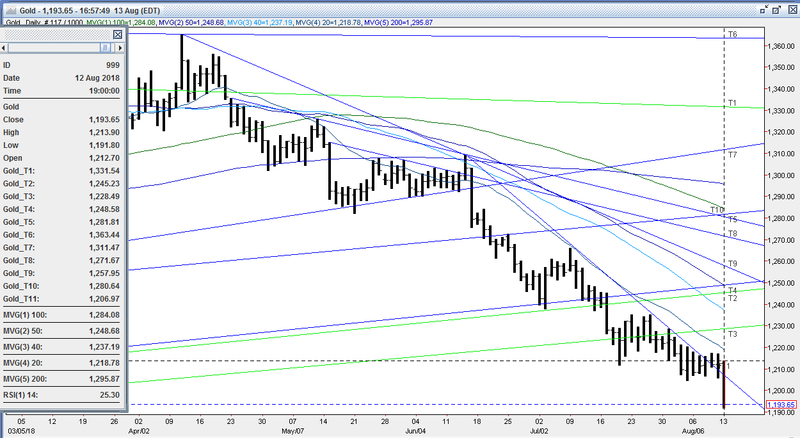 Gold rebounded sharply from some short covering, and reached $1204. By late morning, however, more tough rhetoric from Erdogan (accuses economic terrorists) and the failure of the Turkish central bank to raise rates sent to lira to a fresh low (7.0845). This, coupled with a plunge in the Argentine Peso (30.49) sent US stocks lower (S&P -12 to 2820) into the afternoon, with materials and energy leading losers. A fall in crude (WTI from $67.50 - $65.70) and a warning from Goldman about US companies' emerging market exposure also weighed on stocks. The 10-year yield slipped back to 2.862%, and the euro retreated back under $1.14 to $1.1385. 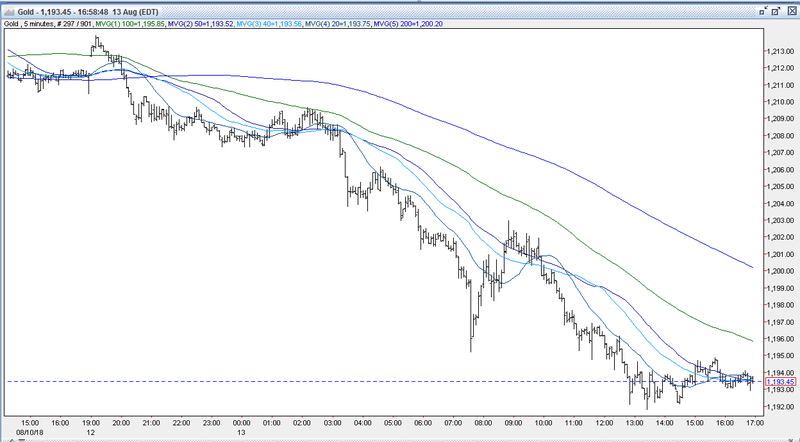 The DX bounced back to 96.45, and knocked gold lower. The yellow metal took out support at $1195, triggering more long liquidating sell stops that took it down to $1191.80 – an 18-month low. Later in the afternoon, US stocks finished near their lows (S&P -11 to 2822), while the US 10-year yield hovered around 2.875%. The DX ticked down to 96.35, and gold clawed back to $1194. Gold was $1193 bid at 4PM with a loss of $18. Open interest was up 3.2k contracts, showing a combination of new bargain hunting longs down to Friday’s $1206 low, followed by some new shorts up to the $1217 level later in the session. Volume was much higher with 340k contracts trading. Some bulls were disappointed with gold’s outsized loss today, and its inability to find traction amid the unfolding currency crisis that strengthened the dollar. 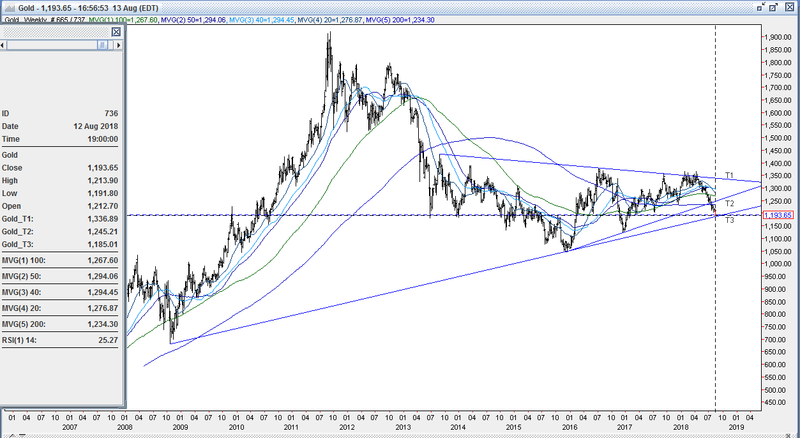 However, other bulls remain steadfast that gold has or is very close to putting in a major bottom. They maintain the market has been extremely oversold - having dropped $173 (12.67%) since 4/11, and $117 (8.94%) since 6/14. Also, its 14-day RSI (currently at 25.4) has spent only 6 sessions north of 35 since 6/14. Bulls strongly believe that the dollar’s rally is badly overextended, and expect a meaningful correction in the greenback from today’s high (up 9.38% since its 88.25 low on 2/14) to help trigger a significant short covering rally in gold. Bulls are looking for gold to consolidate ahead of $1185 (up trendline support from 10/19/08 $682 low), and then challenge resistance at the prior support levels of $1195-98 and $1205-08. In addition, bulls maintain that Friday’s Commitment of Traders Report with a historically and relatively very low Net Fund Long Position (12k contracts, low since Dec ‘15) and a massive and growing gross short position (+22k to 196k contracts –short side of gold becoming an extremely crowded trade) leaves this market set up in a highly favorable position to move up from potential heavy short covering and sidelined longs returning to the market. Some bears took profits today in front of $1205, $1200, and $1195, and will look for renewed strength in gold to rebuild scale up short positions. Other bears, however, are still looking for gold to decline significantly more,as witnessed by Friday’s COT Report showing another large build in fund gross shorts (+22k contracts to 196k contracts). They feel fuel from a firmer dollar will continue to provide downside pressure on gold, and that the dollar’s ability to strengthen against other currency majors (and emerging market currencies if the current crisis lingers) still has legs. They will be gunning for stops below $1185, the up trendline from 10/19/08 $682 low to trip more long-liquidating sell stops to challenge next support levels at $1181, $1177, and then $1175. All markets will continue to focus on geopolitical events (especially with Turkey), developments with the Trump Administration (especially on US-China trade), Q2 corporate earnings, oil prices, and will turn to reports tomorrow on Chinese Retail Sales and Industrial Production, German GDP and CPI, UK Employment Change, Eurozone Industrial Production, GDP, and ZEW Survey, US NFIB Small Business Optimism, Import and Export Prices for near-term direction.